The Label is (Mode 1) , but have been changed to (Mode 2). The 14SGH has all the functions a pilot wants, including flybarless gyro support, S. Bus programmability, Telemetry, FASSTest technology and more! 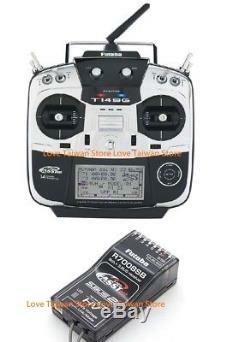 The 14SGH is the only 14-channel system with Futaba's revolutionary 2.4GHz FASSTest technology, and is also compatible with Futaba FASST and S-FHSS protocols, so you can fly with virtually any 2.4GHz air receiver Futaba produces! Additionally, the 14SGH can transmit and receive telemetry data! Heli pilots will prefer the 14SGH's 3-axis gyro support which makes the 14SGH the perfect system for flybarless flight! The innovations don't stop there. Turn the 14SGH over, and you'll see the construction is as rock-solid as any other Futaba system. It's also very comfortable to use, thanks to rubber grips that help minimize flyer fatigue an added bonus that pilots will appreciate. Channels: 12 proportional, 2 switched. Compatible with FASSTest, FASST and S-FHSS protocols. Airplane, helicopter and glider programming. Large, 1.75 x 3 backlit LCD screen with 128 x 64 resolution. SD Card compatibility for external model memory and software updates (SD: 32MB-2GB; SDHC 4GB-32GB). Left and right assignable slider switches. One assignable momentary two-position switch. Comfortable rubber grips on the sides and back. Home/Exit; User Menu/Servo Monitor buttons. Audio earphone jack (for telemetry alarms). 6V 1800mAh NiMH battery pack. V-tail, Ailvator, winglet, motor mixing. Logic switch (condition switch only). Servo monitor (neutral and moving tests). Aileron to camber flap mixing. Aileron to brake flap mixing. Camber flap to elevator mixing. Swash setting (mixing rate, linkage compensation, speed compensation). Transmitting Frequency: 2.4GHz band. System: Switchable; FASSTest14CH, FASSTest12CH, FASST MULTI, FASST 7CH, S-FHSS. 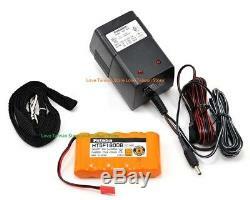 Power Supply: 6.0V HT5F1800B NiMH battery (FUTM1482). 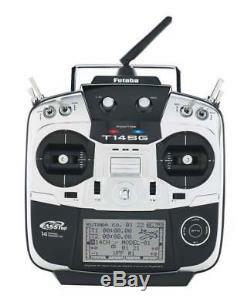 Futaba 14SGH 14 Channel 2.4GHz Computer Radio System on. 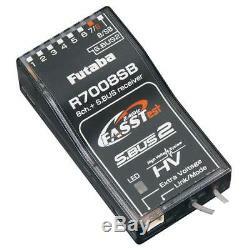 R7008SB Receiver x 1 Pcs. 6V 1800mAh NiMH Transmitter Battery. We provide USA power adapter (2 Plate-Pins) only. Neck Strap, and Switch Harness. All specifications are subject to change without notice. Please check with your supplier for exact offers. Products may not be available in all markets. PCB color and bundled software versions are subject to change without notice. Brand and product names mentioned are trademarks of their respective companies. Manufacture may change Packing box & specification & accessories without notification. It is not acceptable to send the goods to P.
Or we will send at random. Dont cover items that have been abused, burned and damaged in any form. This includes ALL packagingcarton, plastic bag, inserts, manuals etc. Feedback is very important to us. Feedback, so that we can satisfactorily address your concerns. It is impossible to address issues if we do not know about them! Our aim is to provide. Normally so we will try our best to solve any problem. We reserve the right as final authority on examining the return items. 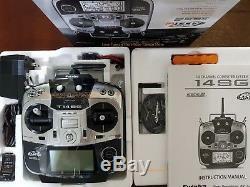 The item "DHL New FUTABA 14SG (MODE 2) RADIO FASST RC TRANSMITTER + R7008SB Receiver x 1" is in sale since Tuesday, November 27, 2018. This item is in the category "Toys & Hobbies\Radio Control & Control Line\RC Model Vehicle Parts & Accs\Control, Radio & Electronics\Receivers & Transmitters". The seller is "genuine-only" and is located in Taiwan. This item can be shipped to United States, all countries in Europe, all countries in continental Asia, Canada, Mexico, Australia.